Emma contacted us after seeing examples of our website design online. She liked our style of work and we liked her product and we hit it off from our first phone call. 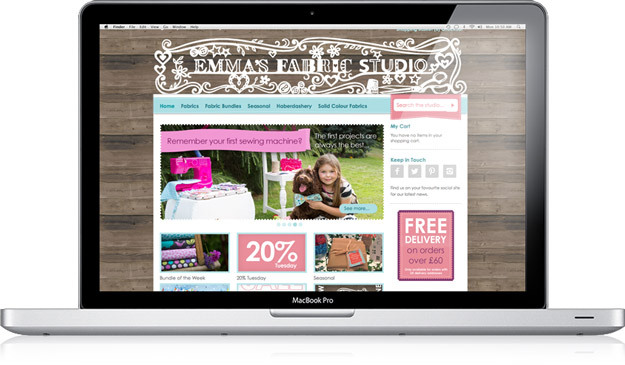 This is the second incarnation of Emma’s Fabric Studio’s website after the first one we did quickly outgrew it’s cababilities with Emma’s rapid growth of products and respective sales. This new design was built on the Magento system and is much better equipped and handling thousands of items for sale. We worked alongside illustrator Julene Harrison to design the header and footer cut-outs. These then formed Emma’s new logo and other branding elements. Emma and us here at Carta will continue to work together to update the graphical side of the website on a regular basis to keep it fresh.